The Coming of Age Ceremony is one of the important ceremonies in Japan to celebrate being 20 years old on The Coming of Age Day. 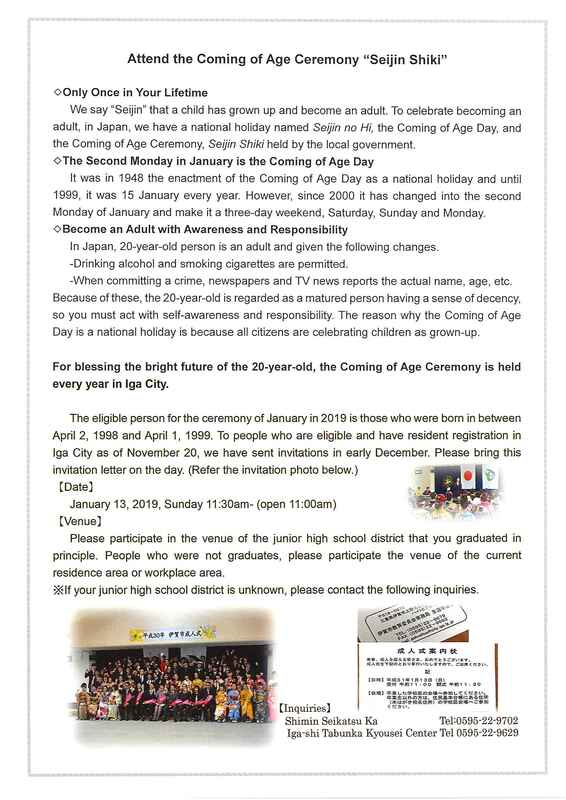 To celebrate the people who became 20 years old, we will have the Coming of Age Ceremony in Iga City. People who are 20 years old, please attend the ceremony to celebrate your Coming of Age and confirm the responsibility and obligation as an adult. On December,　those who are eligible will receive the post card to invite you to attend the ceremony. If you live out of Iga now, you will not get the invitation but you can attend the ceremony with your IDs such as the health insurance certificate or the driver’s license. This is a kind of formal occasions but you don’t have to wear formal dress, tuxedo, or Japanese Kimono. Please come with moderately formal wear or the tie and jacket. 【Venue】Venues in each district shown on the invitation post card, or make an inquiry if you don’t find your venue. 【Eligibility】Those who were born between April 2, 1998 and April 1, 1999.